KANSAS CITY, Mo. 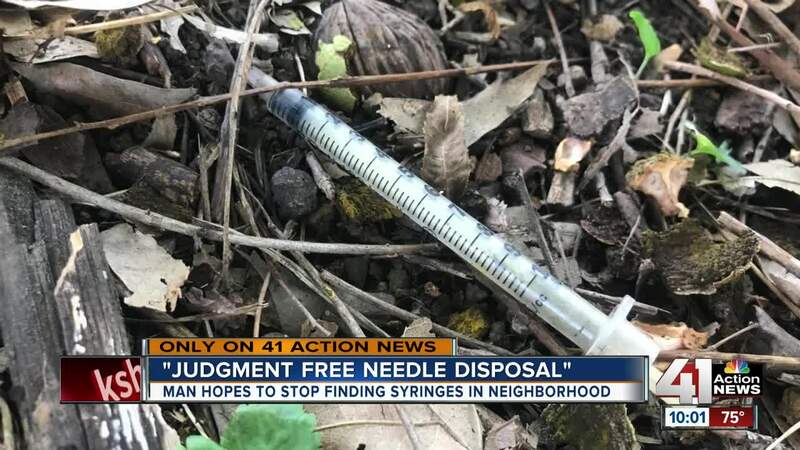 — After finding dozens of syringes and needle caps tossed on a vacant lot, one Kansas City man is taking action into his own hands — putting up a container so people can dispose of their needles in a safe manner. "I just figured I had to get rid of them," said Corey Schaadt. Schaadt first discovered the needles when he took his family dog on a walk. At first, he spotted bright orange caps scattered around the lot near 36th Street and Central Street. Then, he discovered the syringes, some of which were buried underneath leaves, others lying on the ground in plain sight. "Dogs run around here. I've seen kids playing here," he said. Which is why ever since his discovery, Schaadt has made it his mission to look for these items every day and pick them up. On Friday, he took an extra step. He ordered a Sharps container in hopes that those using the syringes will put them in the box instead of tossing them on the ground when they are done. "To prevent needles from being on the ground, you need to prevent drug use. Right now, there is nothing I can do to stop the opioid epidemic," he said. "This is a Band-Aid to a bigger problem." He plans on still looking for caps and syringes daily and emptying the bin every couple of days. "If there is an opportunity for a needle to not be on the ground, you would want to take it. Right?" 41 Action News contacted the Kansas City Neighborhoods and Housing Department, the Health Department and police. Officers say if neighbors see illegal activity, such as drug use, they should call 911. Another option is to call 311 afterwards. KC Care Health Clinic is a clinic located in Midtown, which offers a needle exchange program. According to the clinic, the goal of the program is to reduce health hazards such as spreading diseases and disposing of needles improperly. The clinic is located at 816-753-5144. The clinic accepts needles and will dispose of them in the proper way.